Right now, my co-leader would be laughing so hard she would have tears in her eyes. It isn't that I don't go outside... it's just that I prefer inside. (Did I just admit that on a Girl Scout Leader blog? I think I did... we all have those secrets...) My idea of "camping" consists of a cabin and cooking outside. I do sleep in a sleeping bag inside the lodge... I don't bring an air mattress or cot or entire bed frame. I just don't like tents that much. The ground is harder now than when I was a kid... just sayin'.... and I guess I'm just too darn lazy to pack the entire bed thing... did I mention I have this fear of raccoons unzipping the tent and running through the tent like a crazed animal in the middle of the night and me being stuck in my sleeping bag... yeah, thanks to Troop Camping training... HA! Anyway... back to my point... I do, however, love s'mores. I also love hotdogs over a campfire and onion bombs are... 'da bomb! Banana boats and grilled cheese in a pie iron are up there, too. To build a campfire... well... it's more than just throwing some sticks on the ground and wishing for the best. There is an art to it and depending on what you are wanting to do with the campfire, there are different techniques to build it. Gets confusing fast, right? 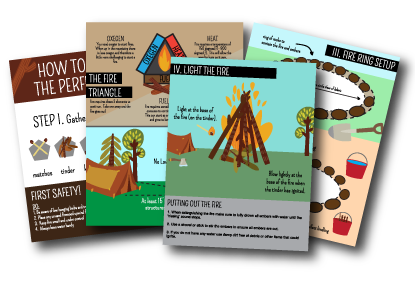 Well... it just so happens I have a GREAT resource for you on How To Build The Perfect Fire and from now until March 10th it's FREE! After that it's like $1.95 and that's a decent fair price. I have to say I was over the moon excited and honored that they reached out to me to give this deal to my readers. How can you get it, you ask? Well... it's easy! Use this coupon code "SparkAChange"
The coupon will give you a 100% discount. Sweet, right? It is. I really like their PDF, too. You can download a color and/or grayscale PDF. Use a real email address and they will email you links to both. You'll be able to get to them on the checkout page, too. My idea is to have the PDF printed and get it laminated for my "camping kit". Then, the girls can use it over and over to help them (and me) remember how to build the correct type of fire.